Personal Power II has a rating of 5.0 stars based on 77 reviews. 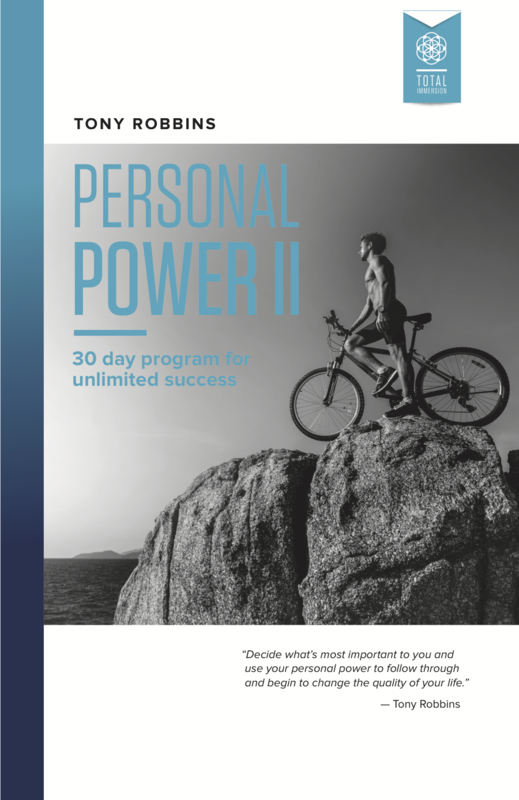 Personal Power II is a 30-day program designed to empower you to take back control of your life and make the changes that will transform your life from ordinary to extraordinary. In this foundational program, you will learn the core strategies Tony Robbins created and mastered as part of his own personal path to success. These strategies will help you, just as they helped Tony, to revitalize your health, get the passionate and loving relationship you’ve always wanted, and achieve financial freedom. "There is a powerful driving force inside every human being that once unleashed, can make any vision, dream, or desire a reality." * Digital product accessible through mobile app only. Available on both Apple iOS and Android. Digital product accessible via mobile app only. Download the lessons to listen to them offline. Keep track of your progress with playback and resume options. Full control of the audio speed. Your personal digital success journal, to maximize your experience. Digital summary cards to help you follow through on each days' lesson. Find your strengths and weaknesses with the Wheel of Life assessment. Discover the power within you to create unstoppable confidence and live a life on your terms. Do you constantly feel that you would achieve so much more if you could just get out of your own way? Most people fail to succeed not because of external factors, but because they let their own fears prevent them from trying. Tony Robbins has spent over 40 years discovering how people can overcome their limiting beliefs to live an extraordinary quality of life. Personal Power II is the foundation of everything that Tony Robbins still practices today – in his career, relationships, health and finances. This is the key to his own personal success, as well as the underlying mindset behind the growth and change he has triggered in professional athletes, world leaders and top business leaders. We all have an area of our life we are looking to improve, but starting often feels too overwhelming that we abandon it all together. With Personal Power II, you will complete small steps each day for 30 days to create real results. Designed to teach you the psychology behind the process of turning your dreams into reality, this program takes the stress out of transformation. Everything you need for an extraordinary quality of life is within you. Unleash it with this risk-free opportunity today. An introduction to the Ultimate Success Formula and how you can take consistent action to produce results. Learn how to use the forces of pain and pleasure to begin creating lasting change in your life. A breakdown of Neuro-Associative Conditioning (NAC) and how it will help recondition your feelings around any situation or person. Dive deeper into NAC as you interrupt your current thoughts and condition them for new, empowering ones. What Everyone Wants and How You Can Get It! Discover the two things in life everyone wants to change and why. Then, learn how you can transform your physiology and state to change anything. Now that you’ve learned how your state determines your ability to change, it’s time to transform your state. The Source of Success or FailureExamine your values and beliefs to determine how they are helping or hurting you. 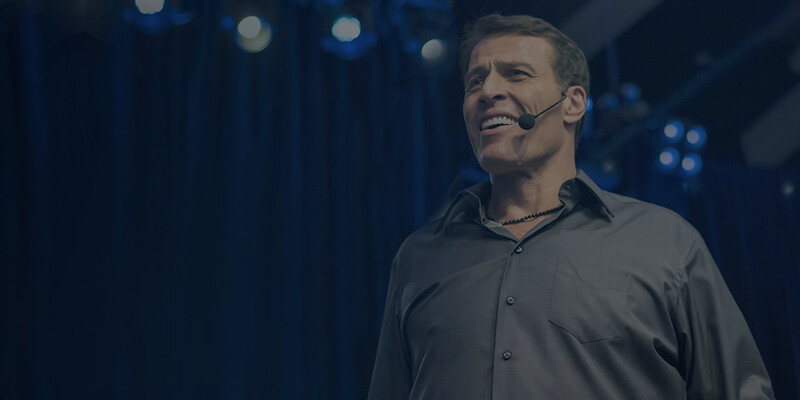 Discover your limiting beliefs and use Tony Robbins’ proprietary method that he uses at his signature, life-changing event to overcome them for good. Now that you’ve overcome your limiting beliefs, create a “why” that will propel you forward. Setting goals is the first step in turning the invisible into the visible. Break down your goals and create an action plan to achieve them. To make room for positive emotions, you need to destroy the negative ones holding you back. Gain leverage over these emotions to get rid of them for good. Learn what anchoring is and how you can create positive anchors to keep you in a powerful state that pushes you towards your goals. An overview of the 7 reasons why people don’t make it financially, and the critical first steps you can do now to start to transform your wealth. Most people are damaging their wealth without realizing it. Re-evaluate your relationship with finances to get on the path to financial freedom. To eliminate fear, we must transform our rules. Learn the erasure technique and how to use it to remove fear from your life. Self-sabotage occurs when we continue to engage in activities or behaviors that bring us pain in addition to bringing us pleasure. Learn to eliminate the ways we chase pain and create self-confidence through the success cycle. You can’t make progress if you have no energy to work towards your goals. Discover two essential keys to vibrant health. Learn why relationships fail and how you can ensure the passion in your relationship never dies. Problems are inevitable. Create a mental state that will allow you to conquer any problem with ease. Using everything you’ve learned, realign your values and goals to create the life you desire. Before I was introduced to Tony Robbins, I struggled to ever really finish things. I was also having trouble making a living. I was constantly afraid of failing and being broke. I really sat down and assessed where I was currently and where I wanted to be. I continue to do this and keep fine-tuning what is working and getting rid of what doesn’t! What are the benefits of a digital program? Don’t have a CD player? Want flexibility and access to the program, at all times? With Personal Power II on the Breakthrough app, you will be able to access all 20+ hours of Tony Robbins audio content, on the go, through a mobile application. What are the benefits of a physical program? Fumbling with your mobile apps? Do you prefer listening to CDs? If yes, this is the version for YOU! Imagine inserting your Personal Power II CD, pressing play and discovering strategies that will transform your life from ordinary to extraordinary! Moreover, the audio quality is great. Where do I access my digital program? After purchasing Personal Power II, you will receive an email with your access information. In the email, you will receive a link to download the mobile application, Breakthrough. The app is available in the Apple App Store and Google Play Store. In addition, you’ll receive access to all the resources for the program, within the welcome email. Already have the app? No problem, simply refresh your product list or sign-out and log back in to gain access to your newly purchased product! What comes with the physical program? 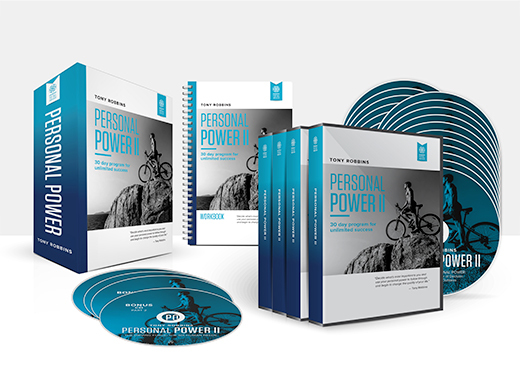 Personal Power II will arrive in a box that contains, your CD and DVD program, bonus content and personal journal. The Body You Deserve can help you make the shift in psychology you need to achieve and maintain a healthy body. Lasting, passionate love isn’t something you find out of luck — it’s something you create. You have 30-days from the date of purchase to request a refund. If received on or before the 30th day, you will receive a full refund. If the request is received on or after the 31st day of purchase, no refund will be issued. You have 30-days from the date of purchase to request a refund and return an item. If the request is received on or before the 30th day and the item is postmarked within 3 days of the request you will receive a full refund; otherwise no refund will be issued. We will cover return shipping on orders within the United States (any orders outside the United States are responsible for any and all return shipping, tariff, custom or other related charges). In some circumstances we offer risk-free trials. There are two types: digital trials (on the Breakthrough App) or physical trials (which are shipped to you). Digital trials last 7 days. You will be charged a non-refundable processing fee the day you sign up for the trial. If you decide to continue with the product, do nothing and you will automatically be charged three equal monthly installments to the credit card on file. You must cancel on or before the the 7th day if you do not wish to continue, and to avoid being charged the monthly installments. You have 30-days from the date you initiated the trial to request a refund for your first installment. If a refund request is received, you will be given a full refund on the first installment. If the request is received on or after the 31st day after signing up for the trial, no refund will be issued. The processing fee for the trial is non-refundable and will not be returned, regardless of when you cancel. Physical trials are 30-days. Upon purchase of a 30-day trial your credit card will be billed a non-refundable processing fee, plus shipping, handling and state tax. If you decide to continue with the program, do nothing and you will be automatically charged three equal monthly installments to your card on file starting on the 30th day. If you decide to return the item, you must request to cancel on or before the 30th day and the item must be postmarked within 3 days of the request to avoid further charges. We will cover return shipping on orders within the United States (any orders outside the United States are responsible for any and all return shipping, tariff, custom or other related charges). If you fail to cancel by the 30th day, or your return is not postmarked within 3 days of your request, you will be charged the three monthly installments. Once billed your first installment, you are no longer eligible for a refund (unless a prior request was received and correct actions were taken). If the request is received on or after the 31st day after signing up for the trial, you will no longer be eligible to cancel and will be charged the three monthly installments. The processing fee, state tax and any shipping and handling fees for the free trial are non-refundable and will not be returned, regardless of when you cancel. If returning an item, please contact customerservice@tonyrobbins.com within the stated return period, who will provide you instructions for returning your product(s). You are responsible for all shipping costs and other costs incurred for returning your item (unless otherwise specified). Original shipping costs are non-refundable and your refund will be on the product cost only. The time it will take for your returned item to arrive to us and be processed will vary depending on the shipping method you select. Once received, we will process the refund within one week and your funds should appear within 2 weeks of the return being processed. If you are shipping an item over $75, we recommend adding tracking and insurance to the shipment. We cannot guarantee that we will receive your returned item. For our international customers, shipping charges do not include any potential tariffs, duties, custom or other fees or taxes that an individual country may impose upon import. You are responsible for any additional fees that may be levied by the country where the product is being imported. Any unopened, untampered with currently marketable products may be returned within 30-days after purchase for a full refund. Any opened supplements are not eligible for a refund. If a refund is requested on or after the 31st day or if the product is opened when received, you will not be eligible for a refund. We currently only ship supplements within the United States. If an international order is processed we cannot guarantee the shipment will arrive; all fees from customs, tariffs, or any other fees or loss incurred are the responsibility of the buyer. We do not permit international refunds on the supplement line. Once your return is received and inspected, we will send you an email to notify you that we have received your returned item and notify you of the status (approval or rejection) of your refund. If your refund is approved, then your refund will be processed, and a credit will automatically be applied to your credit card or original method of payment, within 7 business days. If you returned a digital or physical product please allow up to two weeks for your charge to be refunded. If after two weeks you do not see your refund appear, please first call your bank or credit card to confirm whether it is pending. If the bank or credit card does not see your refund pending and you still have not received your refund after two weeks, please contact us at customerservice@tonyrobbins.com. We do our best to ensure you receive undamaged products. If, however, you have received an item that is defective or was damaged prior to arrival, we will promptly exchange it upon notification for an identical product. If this occurs, please send us an email at customerservice@tonyrobbins.com, and instructions will be provided for returning the defective or damaged merchandise. Please refer to the specific event’s webpage you are enrolled in for cancellation and refund information. If you are unsure how to access that, please contact your Personal Results Specialist or email us at: customerservice@tonyrobbins.com. Please refer to your coaching agreement for cancellation and refund information. You deserve to have a vibrant and fulfilling life. Tony will coach you through these life changing principles. All we ask is you promise to open the box and actually listen. If you simply commit to doing that, YOU WILL SEE RESULTS. So, make a decision to maximize who you are, what you’re capable of, and what you get to enjoy out of this life. But don’t just listen to this program, DO IT! If you start the program and don’t feel like it is working for you, you can return the entire system at no cost to you within 30 days of purchase. Simply contact our Customer Service team at 800-488-6040 within 30 days of your purchase and request a refund. We’ll even pay for the return shipping on domestic orders! The only risk is inaction!